At McGuckin Chiropractic, we provide the most up-to-date treatments for spinal conditions. Light manual and instrument-based adjustments are used to restore your spinal health. Traction offers a stretching and comfortable mobilization of spinal discs to increase blood flow speeding repair and to reduce swelling for neck and low back pain. The traction also reduces muscle spasms and helps the ligaments and tendons heal. The traction treatment also increases joint movement in the painful back as well as with arthritic conditions. Spinal Adjustment is done with instrument – Impulse Systems® device for comfortable non force treatment to the spine as well as light manual adjusting, and a drop table for the lower back. Hand-applied soft tissue work is used on every visit to break up muscle spasms and to aid in relaxation so that your spinal adjustments can have their greatest effect. Micro current therapy is a sound wave therapy mixed with a low electrical current. This device stimulates cells to give nearly immediate changes in an injured area. It helps to reduce pain and stimulate the healing process, all in one treatment. Neurovascular Dynamics – Bennett Reflex Technique. This chiropractic technique helps detoxify the body and stimulates repair of organs, muscles and nerves. 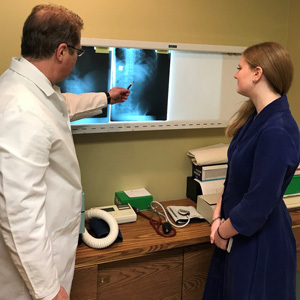 On-site X-ray is available to help properly diagnose injuries and to find out why individuals have longstanding spinal problems. Stabilization exercises aid in recovery from injuries. After doing an individual muscle balance assessment, Dr. McGuckin can determine specific stabilization exercises to address your exact problem, finding a solution for longstanding spinal pain. Therapy Machines are used to aide in decreasing muscle spasms and reducing pain. Ultrasound, electric muscle stimulation and micro current are used as needed to aide in healing and speed repair. Find out what we can do to help you heal and repair. Contact us today!